At the same time Richard Montgomery and Benedict Arnold were attempting to take Quebec, the main topic of the last few episodes, George Washington remained outside Boston, mostly watching and waiting for an opportunity to do something. Washington was always restless, and looking for a way to break the siege. He sought and received approval from the Continental Congress to bombard and destroy Boston if he deemed it a military necessity. This was no small concession from Congress. The President of Congress, John Hancock, stood to lose his mansion and all of his other property in Boston if this happened. Washington also engaged in many small raids against the regulars. On January 6, he sent 200 men under the command of Major Thomas Knowlton to raid the Charlestown Peninsula, where the British occupied Bunker Hill. The purpose of the nighttime raid was to burn 14 houses that could be of use to the enemy. The Continental raiding party shot one sentry, which immediately caused the British to fire blindly in their direction. The party ignored the shots from Bunker Hill, set the houses on fire, captured five regulars and retreated back across the neck to Cambridge. The main reason anyone remembers this minor raid is that the top military brass in Boston were enjoying a play written by Gen. Burgoyne called The Blockade of Boston performed by their fellow officers. During the play a soldier rushed on stage to call on everyone to turn out because the rebels were attacking. The crowd simply laughed and assumed it was part of the play. It took a few minutes to convince everyone this was a real attack. All the officers had to scramble out of the theater and rush to their regiments. Of course, by the time they were ready to go, the raid was over and the Continentals had returned to their lines. Raids were one thing, but if Washington ever hoped to take the city, he would need more artillery, not just field pieces, but large cannons and mortars that could take down fortifications and destroy navy ships. Back in the spring of 1775, Benedict Arnold and Ethan Allen had taken Fort Ticonderoga and several other forts along Lake Champlain, providing the patriots with about 200 pieces of artillery. Since that time though, most of the weapons continued to sit unused at Ticonderoga. At first, Congress wanted to hold them to give back to the British once this misunderstanding had been resolved. Then, New York did not want to let the weapons go to New England. But with the creation of the Continental Army, and the realization that this was a long-term fight, these concerns had faded. By fall, Washington decided that he needed these weapons for use against Boston. Getting them there, would not be easy though. Some of these cannons weighed over 5000 pounds. Dragging them across rivers and over mountains was going to be hard work. The man Washington chose for the job was not an obvious choice. I introduced Henry Knox back in Episode 73 when George Washington appointed him as the new Commander of Artillery in November 1775. As Commander of Artillery, Knox’s first mission was to find some artillery to command. Washington ordered Knox to go to Ticonderoga and bring back the cannon. Knox always seemed to me like a really improbable choice. The guy was 25 years old, overweight, missing a couple of fingers on one hand from a shooting accident, and had never served in combat. He had dropped out of school at age 9 after his father’s business failed. His father left the family and took off for the West Indies, never to be seen again. 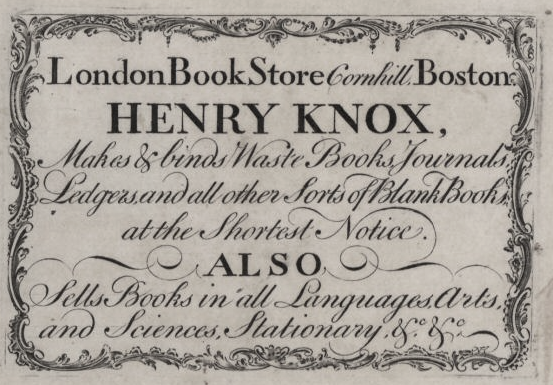 As an adult, Knox had run a Boston bookstore, which had been a popular hangout for British officers during the occupation. You may recall back in 1774, the Massachusetts Assembly met to select delegates to the First Continental Congress. Gov. Gage sent a messenger to the Assembly ordering them to dissolve immediately. The Assembly locked their doors and proceeded to appoint a delegation while the Governor’s representative was banging on the door demanding that they stop what they were doing. That guy banging on the door was none other than Thomas Flucker. As a royal official, Flucker remained a staunch and prominent Tory in Massachusetts. For many years, he had served on the Governor’s Council. His son was a regular officer in the British Army. Flucker not only objected to his daughter’s relationship with Knox based on Knox’s patriot leanings, but also because he was a nobody shopkeeper. He was not even a very successful shopkeeper. 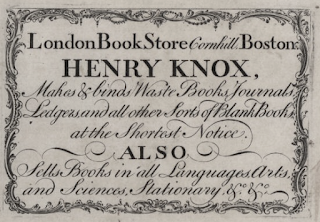 Knox’s business struggled under trade restrictions, making it more difficult and expensive to import British books. The Boston Port Act ending all trade with Boston pretty much killed his business entirely. Flucker thought his attractive daughter could snag a British officer, perhaps even an aristocrat. He did everything he could to dissuade Lucy from continuing a relationship with Knox. Lucy was only 17 at the time she wanted to marry the 24 year old Knox. Her father pointed out that this marriage meant she would likely be a poor working class wife, separated socially from her sisters and others in the family. But you know how kids are. Henry and Lucy continued their relationship in secret until Lucy finally convinced her father to allow the marriage. Despite personal misgivings and arguing that she was making a terrible mistake, Flucker gave his daughter’s hand in marriage to Knox in the summer of 1774. He even arranged for Knox to get a commission in the British Army as a captain, an offer that Knox politely refused. Despite his Tory family connections and lack of military experience, Knox did have a few things going for him that justified Washington’s appointment. Knox was a member of the Sons of Liberty and an outspoken patriot. Growing up, he had been a member of of Boston’s South Side gang, which had engaged in the annual Pope’s day riots. He was a street rat, who knew how to fight. At the same time, as an apprentice in a bookstore, he also learned how to cultivate customers and behave in polite society. Knox was at the center of several key events. He had been a prominent witness at the Boston Massacre in 1770. Witnesses testified that he had tried to calm the patriot rioters, as well as trying to keep the regulars from firing. There is also good evidence that Knox was one of the “indians” who dumped tea into Boston Harbor in 1773. Knox served as a militia officer in Boston’s artillery company. Knox carried a great many military books in his store. He studied these books carefully. At least on paper seemed to have a good knowledge of military strategy and tactics. At one point the British, had asked Paul Revere to spy on Knox, not yet realizing that Revere was also a patriot. The two men would often meet in Knox’s bookstore and have fake arguments in front of British officers to keep up the guise that the two friends hated each other. After Lexington, Knox and his new wife slipped out of Boston. Knox did not join the patriot army with a formal enlistment or commission. Rather, he served as a sort of civilian adviser, helping with the defenses around Roxbury. I’m still not clear if he had any role in the battle of Bunker Hill. Some sources indicate he directed some cannon fire for the patriots, but it does not sound like he was even on the Charlestown Peninsula during the battle. If he did anything, it was from a distance, and he still had no formal military commission. When Washington arrived, Knox apparently impressed the new commander with his book knowledge of artillery and military strategy. The two men dined together on several occasions, sometimes with Lucy present as well. Perhaps the fact that both men were Freemasons may have helped. Knox’s young and attractive wife apparently got along well with Washington, who had a weakness for flirting with young ladies. Knox was also well connected. He was good friends with Gen. Nathaniel Greene as well as John Adams and a number of other influential patriots. They all endorsed Knox as a competent and dedicated patriot. The prior artillery commander Richard Gridley, was in his mid 60’s. He had done a mediocre job at Bunker Hill and really did not seem interested in continuing in the job. Citing illness, Washington was determined to replace him. Gridley would stay on as Chief Engineer, but would give up his role as Commander of Artillery. Gridley’s second in command even endorsed Knox to be the new commander. So there seemed to be a consensus that convinced Washington to go ahead and appoint Knox as the new commander of artillery. Knox’s Commission was just the sort of thing that drove experienced combat officers nuts. While officers like Benedict Arnold were off fighting real battles, guys like Knox were hanging around with important people back where it was safe and brown nosing top military officers and political leaders with talk backed by zero military experience. If Knox had failed as an officer, it would have been easy to see why. But as we will soon see, Knox not only talked the talk, he could walk the walk. He proved himself to be a highly capable officer. In November 1775, under Washington’s orders, Knox set out in search of cannon. He was not yet officially a commissioned officer as that would require an Act of Congress. But little things like that did not seem to bother anyone. Washington gave him a command and $1000 to collect artillery for use against Boston. Knox first set out for New York City, where he met with former Patriot agitator and now militia Colonel Alexander McDougal. Knox tried to acquire some of the New York artillery for use in Boston. McDougal offered a few smaller pieces, but was unwilling to part with the larger guns that he wanted to use in New York against the British in New York Harbor. Knox then set out for Ticonderoga to collect what he could get there. You may recall that the patriots had captured about 200 pieces when they took Ticonderoga and the surrounding forts. But only about half of those were serviceable. Some of the serviceable ones were now in use by Montgomery and Arnold in their attempt to take Quebec. That whole invasion was still the focus of everyone’s attention in December. So Knox had to pick from among what was left at the fort. On his way out to Ticonderoga, Knox spent a night in a home with a British prisoner of war, Lt. John Andre, who Montgomery had captured at Fort St. Jean a few weeks earlier. The men apparently had an enjoyable conversation, and under other circumstances, probably would have led to a good friendship. Knox did not discuss any details of his mission with Andre, but the two Freemasons had an enjoyable night. 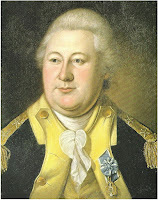 Years later, Gen. Knox would head the court martial that condemned Major Andre to death. Based on a letter from Washington, Gen. Schuyler handed over all the Ticonderoga artillery to Knox, still a civilian, to carry back to Cambridge. From the inventory, Knox selected fifty-nine pieces, forty-three heavy cannon, six cohorns, eight mortars, and two howitzers. In total, he had about sixty tons worth of weaponry to drag back to Boston. The largest pieces weighed as much as 5000 pounds. Knox optimistically thought he could drag all this equipment 300 miles, across lakes and over mountains in a little over two weeks. But it would not be that easy. In early December, he set out on the first leg, moving the guns by boat down Lake Champlain to Fort George. One of the boats commanded by his brother, hit a rock and sank. Fortunately, all the men survived and the equipment salvaged, but just getting the equipment to Fort George took until December 15. By this time, the temperature had fallen below freezing. Knox would not attempt to use boats to move the guns down the Hudson River. 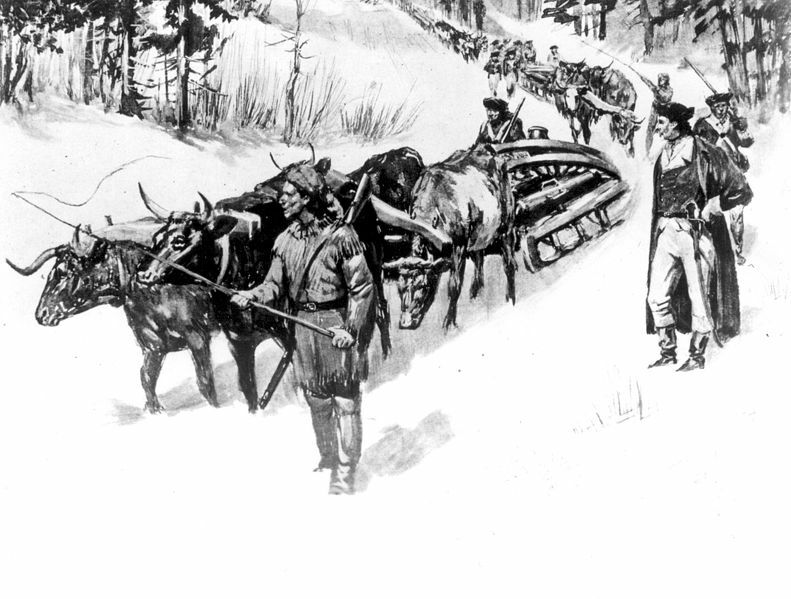 Instead, he would use sleds to carry the guns along the banks of the Hudson over the ice and snow to below Albany, then across Massachusetts. There were two problems with that plan, he had no sleds, and there was no ice and snow. December 1775 in inland New York was unusually warm and dry, without enough snow to pull the sleds overland. By Christmas Eve, the region finally saw a decent snowfall. But the party still did not have enough sleds. Gen. Schuyler had fired the military contractor who was building the sleds, because the contractor wanted too much money. Somehow they found other local carpenters to build the sleds, assembling 42 sleds to carry the guns. Knox's team then scoured the area for animals and teamsters to drive the sleds. Knox had also hoped to use oxen to pull the heavy equipment, but could not find enough of them. He would have to use horses for many of the sleds. Knox continued to have problems with the weather. By January, there was snow, but too much snow. Drifts of two to three feet made it nearly impossible for the horses to make much headway. Some days they could only travel a few miles. They hit additional problems with river crossings. Their route would require crossing the Hudson River multiple times. Although it was freezing, it had not been cold long enough for a thick layer of ice to form over the rivers they needed to cross. The ice simply was not thick enough to hold the heavy sleds. The men tried to thicken the ice by drilling holes in it. This forced water, under pressure below the ice to flow up over the existing ice and freeze. The work further slowed the progress. As the train progressed, Knox decided to leave the men on their own. Knox was not a hardened military officer. He enjoyed good company in a warm home rather than sitting in a cold miserable tent at night. He had his men continue on there own and rode off to spend the evening with Gen. Schuyler. While having dinner with Schuyler, a messenger reported that one of the largest cannon had broken through the ice and was sitting at the bottom of the Hudson River near Albany, NY. Knox realized he could not delegate his leadership. He rejoined the train, directly supervising the movement of the remaining guns across the river. Rather than abandon the lost cannon, Knox recruited locals from Albany to recover the gun. There are not a lot of specifics about how they did it, but they somehow got ropes around the drowned cannon and pulled it out of the river and onto a new sled. In thanks to the people of Albany, Knox christened the cannon the “Albany,” a name it would use for the remainder of its service in the war. After this incident, Knox stayed with the train for most of the rest of the journey to ensure no more problems. This probably meant harder going for him as he did not spend much time visiting with people along the way. Unfortunately, it also meant that he gave up on his regular diary entries, meaning we know a lot less about this final leg of the journey across Massachusetts. But the team managed to get the guns over the mountains of western Massachusetts. Knox made no attempt to keep his mission a secret. Instead he showed off his weapons to interested crowds in the towns and villages he passed along the way. Friendly locals often provided food and shelter for his men as they made the difficult journey. At Westfield, he reportedly fired one of the larger guns to impress the locals. He hit his next challenge at Springfield when his train reached the Connecticut River. The New Yorkers he had hired to bring the guns that far were exhausted and wanted to go home. They had only agreed to go as far as Springfield, and were ready to be done. It had gotten warm again. Most of the snow melted and the sleds would not work. Knox had to pay off his men and wait for the weather to change again. A few days later, it did. Now that they were in central Massachusetts, there were plenty of friendly locals willing to help continue the mission. Knox was able to hire a new crew of Massachusetts men, along with new teams of oxen to carry the guns the rest of the way. As the train got closer to Cambridge, Knox once again abandoned his team and rode ahead. By now at least, they had passed over all the most difficult hurdles. He arrived in Cambridge on January 24, 1776 to inform Washington that the guns would arrive in a few days. Although some records dispute the exact date. He also learned that Congress had granted him his commission as Colonel in the Continental Army. I guess that’s good since it would have been a shame if they had denied it and he would have had to carry all those cannons back to Ticonderoga. But fortunately, that was not a problem. The next day, the train arrived in Framingham. There, John Adams and Elbridge Gerry inspected the guns along with other locals excited to see the new force of artillery that would soon be pointed at the regulars in Boston. A few days later, on January 27, the Noble Train, as Knox had called it, arrived in Cambridge, making Knox the toast of the army. Knox had proven himself a capable leader of men, not yet in combat, but at least as a logistical officer. It had taken him nearly six weeks to get the artillery back to Cambridge, far longer than the two and a half that he had planned. Even so, everyone hailed the mission a great success. He even brought in the expedition under budget and could return some of the advance money he took for the mission. On February 1, he and Lucy dined with George and Martha Washington. Martha had joined her husband in Cambridge a few weeks earlier. Martha and Lucy would go on to become close friends as their husbands worked together over the next few years in the fight for liberty. Over the next few weeks, Col. Knox would oversee the deployment of his new guns in Roxbury and other areas around Boston. He would also take command of the artillery regiment. Knox was also pleased to learn that while he was away, the Patriots had captured the British ship Nancy which included in is stash of arms, over 3000 cannonballs. Now, in addition to the guns, the Patriots had some ammunition as well. Now if they could only find some gunpowder, they would be in business. Puls, Mark Henry Knox: Visionary General of the American Revolution, New York: St. Martin's Press, 2010 (Book Recommendation of the Week).